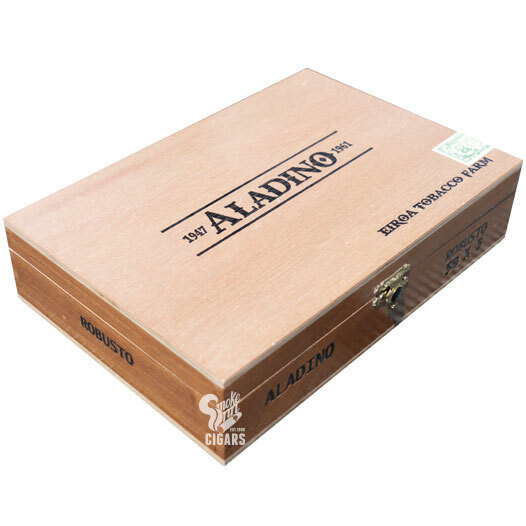 Buy Aladino by JRE Tobacco Company Cigars Online! Aladino is the centerpiece line from the relatively new JRE Tobacco Company. But despite debuting in 2015, JRE holds roots that date much further back, as the company is the creation of famed Honduran tobacco grower Julio R. Eiroa. If the name sounds familiar, it’s because Julio is the father of Christian Eiroa, owner of the CLE Cigar Company. In addition, Julio and Christian were the former owners of the renowned Camacho Cigars brand. The Aladino name stems from a vintage movie theater in Danlí, Honduras, which the Eiroas have converted into an operational cigar factory. For this special blend, Julio has crafted an old school “Authentic Corojo” puro blend, using Honduran Corojo tobaccos grown on Julio’s “Eiroa Tobacco Farm” in the Jamastran Valley of Honduras. As such, the Aladino blend has been hailed for its resurrection of the Cubanesque profile seen from the famed Habanos of Cuba’s heyday (1940s - 1960s). The cigars showcase a vintage “no frills” appearance, bringing the focus strictly towards the premium tobaccos used. Expect a medium-plus body and a fiery blast of black pepper and cayenne in the retrohale, joined by notes of medium-roast coffee, pretzel dough, cedar, cashews, and a rewarding buttery finish.